As a native of Central Florida, I’ve been around citrus fruit all my life. I grew up on a dirt road that had a couple of houses and thousands of orange trees on it. I remember sitting on my swingset and watching the workers pick the fruit. They were paid by the box, and boy could they pick that fruit fast! All the boxes were then loaded on semi-trailers and hauled to the Donald Duck processing plant in town where the fruit was turned into frozen concentrate. I’ll never forget driving by a processing plant in another town when I was a teenager. There were so many trailer loads of fruit sitting out in the sun rotting while waiting to go into that plant to be processed. 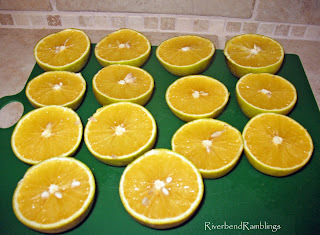 After seeing and smelling all that fruit, I vowed never to purchase concentrated orange juice–yuck! I couldn’t believe they would use all that rotten fruit to make orange juice. Hopefully that was just one really bad day at that plant and not a regular occurrence. The citrus industry was huge around here until a series of big freezes hit Central Florida back in the early 1980’s. Many citrus growers, including my grandpa, were wiped out. Some growers started over from scratch and stayed in the business. Others turned their land over to developers. What a change took place in the landscape! It’s amazing to see huge housing developments where mile after mile of trees used to be. Today our county still produces a lot of orange juice and ships fruit all over the country. but business is nothing like it used to be. Even in the local stores you hardly ever find local fruit; most of it comes from California. I’ve never understood that. We have a fruit cocktail tree in our yard. It’s supposed to have lemons, honeybells, and navels on it. I’m a little worried that everything will end up tasting like a lemon, but we’ll see. I would like to get a grapefruit tree planted in the future. I like to eat grapefruit for breakfast. My neighbor across the street brings over a bag of oranges from his tree once in a while, and my in-laws have a couple of trees that we put to good use. What tastes better (and costs much less) than store-bought juice? I have never heard of a fruit cocktail tree before ~ how interesting! What a treat to go out and pick a “little bit of heaven” off your tree every day! 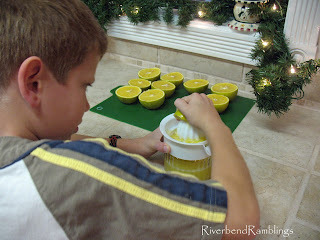 What a nice thing to be able to make your own fresh squeezed juice! I lived in Florida with my girls when my husband was stationed on a unaccompanied tour in Okinawa. We enjoyed every moment of it! love your new look 🙂 very pretty! hope all is well there!!!!!! WOW….how blessed you are to have this tree! Looks delish! Wow, do I miss those oranges! My grandma used to live in Vero Beach, and we would spend every Christmas there. I would walk out every morning and get an orange for my breakfast. Nothing in the stores taste anywhere close to those fresh from the trees! Lucky you! Wow, I enjoyed that little history lesson. When we lived there, I thought that there was TONS of orange groves around, and loved smelling the orange blossoms. Hmmmmm! Here where we live now, it used to be a big Orange City, (Hint Hint) but a freeze in the 1800s knocked it out. Now, there is not ONE orange grove in our city. Kind of Ironic seeing our city was named for the citrus industry.